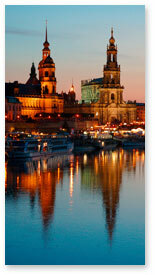 Saxony, Germany’s easternmost state looks back on a long history which spans over 1000 years. As is true for much of Germany, this territory has undergone numerous political metamorphoses from a medieval duchy, to a kingdom, to the federal state it is today. This distinct history is reflected to this day in the special title “Free State” which Saxony holds dear, similar to its southern neighbor Bavaria. 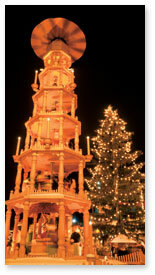 Christmas in Germany is all but unthinkable without many of the traditions, treats and crafts from the state of Saxony. What would German Christmas be without the traditional sweet bread called Dresdner Stollen or the wonderful woodcrafts from the mountainous area known as the Erzgebirge, the Ore Mountains? Saxony is also home to Germany’s oldest Christmas market, the Striezelmarkt in Dresden, the earliest record of which dates back to 1434. 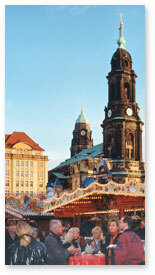 With a population of over 4 million and the most vibrant economy among the former GDR states, Saxony has much to offer. The state owes much of its strong economy to the three major cities of Dresden, Leipzig and Chemnitz, which together once formed one of the most important industrial centers in Germany. Saxony’s capital Dresden has often been likened to Florence, hence its common name Elbflorenz, or “Florence on the Elbe.” Pre-World War II Dresden was indeed an architectural marvel which was almost completely destroyed towards the end of the war. The city has since reclaimed some of its former glory through reconstruction. Modern Leipzig is known as Saxony’s economic powerhouse, but its worldwide reputation is founded on the city’s importance as a music, publishing and trade show hub. Without a doubt, the baroque composer Johann Sebastian Bach, who lived in Leipzig from 1723 until his death in 1950, is the city’s most well-known resident. Like no other city in Germany, Chemnitz stands for engineering and innovation. At the end of the 19th century, Chemnitz registered about six times more patents than anywhere else in Germany. While much smaller in size than these three major Saxon urban centers, the city of Wittenberg can lay a claim to fame all its own. It was in Wittenberg in 1517 that Martin Luther single-handedly started the movement which went down in history as the Reformation. Various mountain ranges in the state’s South form Saxony’s geographical backbone. Giant sandstone rock formations, known as the Sandsteingebirge (Sandstone Mountains), also often referred to as Saxon Switzerland (Sächsische Schweiz), are a favorite tourist attraction which enjoys special popularity among rock climbers. The Erzgebirge, or Ore Mountains, a mountain range which forms the physical boundary between Germany and the Czech Republic, are often referred to as the “Land of Christmas.” The region owes its festive fame to its world-renowned seasonal woodworks. Craftsmen from the region have exhibited their wooden products at the Leipzig trade fair for over 300 years, going back as far as 1699. When the wealth of the silver mines in the mountains was exhausted, the former miners turned to knives and turning chisels to support their families. Nothing epitomizes German Christmas specialties quite like Dresdner Stollen. The name “Stollen” is taken from miners’ language and describes a support beam, a fitting name for a sweetbread without which Christmas in Germany just would not feel complete. Another interpretation likens the shape and look of this seasonal specialty to the swaddled newborn Jesus. Saxony’s most well-known culinary specialty dates back to as early as the 14th century. What started out as a dry white bread customarily prepared during the pre-Christmas Advent season has developed into a beloved culinary treasure. Originally, Stollen was prepared using nothing but flour, water, yeast and oil, in compliance with a decree passed by the Roman Catholic Church according to which people were not to use butter and milk during Advent. Thanks to a petition by a prominent representative of Saxony’s nobility, who also happened to be a passionate gourmet, the Pope granted Saxon bakers an exception to this “butter ban.” In return for payment of a fine, bakers would be permitted to add milk and butter to their Stollen “with a clear conscience and God’s blessing.” This marked the beginning of an ongoing competition among Saxony’s master bakers to see who could bake the finest Stollen. To say that Saxons love their coffee might be considered a gross understatement. Saxons look back on a long tradition of a so-called Kaffeehauskultur, or “coffee house culture.” Whereas today we have fairly simple cafés, Europe’s coffee houses used to be much grander in scale and served as vital centers of communication, essential to society’s commercial and cultural well-being. Coffee arrived in Europe in the 17th century and quickly gained popularity among all social classes. For a while, it even pushed beer off its pedestal as the people’s favorite beverage. In the mid 18th century, when Germany had no colonies and no easy access to coffee beans, beer was heavily promoted again as the German beverage. In Prussia the ruling class went as far as passing a decree forbidding coffee consumption. The uniquely Saxon expression of Blümchenkaffee, little flower coffee, an especially weak cup of coffee, might date back to that period when coffee was scarce. In order to fully understand this concept, it helps to know Saxony’s world-renowned porcelain manufacturer Meissen and its products. Meissen porcelain was the first high quality porcelain to be produced outside of China. The first European porcelain was manufactured in Meissen when the Royal Porcelain Factory was opened in 1710. Often families own a set of Meissen porcelain which is proudly handed down from generation to generation. Meissen’s delicate tea and coffee sets (consisting of tea/coffee pots, serving plates, cups and saucers) are made from the finest porcelain and one of their most beloved classic designs is a very colorful flower design. The cups are decorated with these little flowers not only on the outside but they also have a flower design on the inside, centered on the bottom of the cup. If coffee is brewed too weak, the flower is still on the bottom of the cup will still be visible – little flower coffee. Take it from the Saxons, get out your favorite cake or pastry recipe, preheat the oven and off you go. If you are not much of a home baker, there are plenty of stores offering seasonal specialties from Germany. Then, set out your best china and invite some friends over for an afternoon of coffee, cookies and cake.